The workbook that I give out exclusively at my seminars is now available to you. 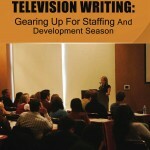 It is 30 pages long and chock full of all the information you need for staffing and development, including the components and structure of strong spec and pilot scripts, story breakdowns of current shows, career tips and the results of a questionnaire to top studio and network executives. Shows discussed in this workbook – DEXTER, BREAKING BAD, MAD MEN, BROTHERS & SISTERS, WHITE COLLAR, PARENTHOOD, HUNG, HANK and MODERN FAMILY.